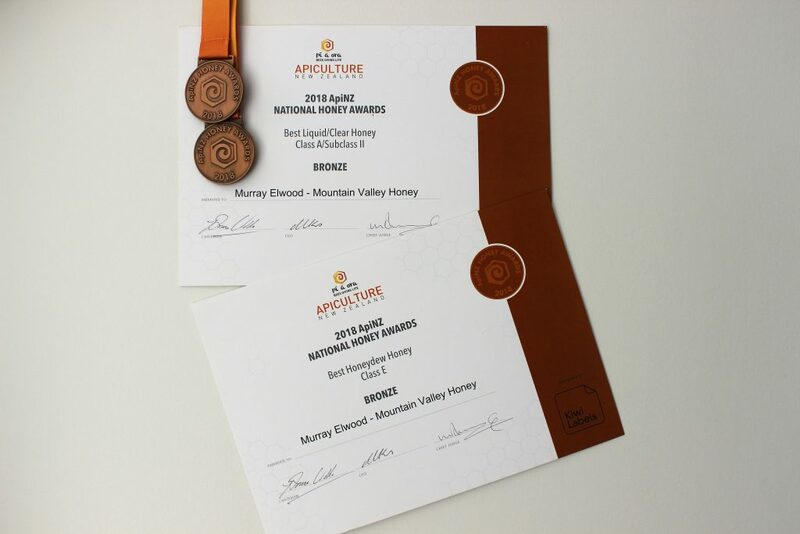 Two bronze medals for Mountain Valley Honey! To the victor goes the spoils – or more appropriately, two Bronze Medals were awarded to Mountain Valley Honey for our Kamahi and Honeydew honey. What was just as special was sharing the win with other awardees at the recent Apiculture New Zealand Conference. The annual event is an opportunity for beekeepers nationwide to gather and listen to international speakers, attend workshops, learn skills for a variety of areas in their business, and keep up with the latest innovations within the Apiculture industry. Our Kamahi honey is collected early in the honey flow. A personal favourite for co-owner Nicky Elwood, it is light in colour and has a nice texture and mild taste. Honeydew is later in the season and is collected by the bees from the Native Beech trees. It has a dark colour and strong taste and is a favourite for many people. Mountain Valley Honey regularly enter their honeys into the conference competition. “We have won medals and awards in the past, which is always a great thrill. Our Manuka, Autumn Gold and Native Bush honeys have also won awards over the years,” says Nicky. “We love taking part in the competition. It’s wonderful to see the pride in all the contestants who are showcasing wonderful New Zealand honeys. To be able to celebrate together the diversity of the honeys across New Zealand is cool. Nicky says that being recognised for her own honey is special.